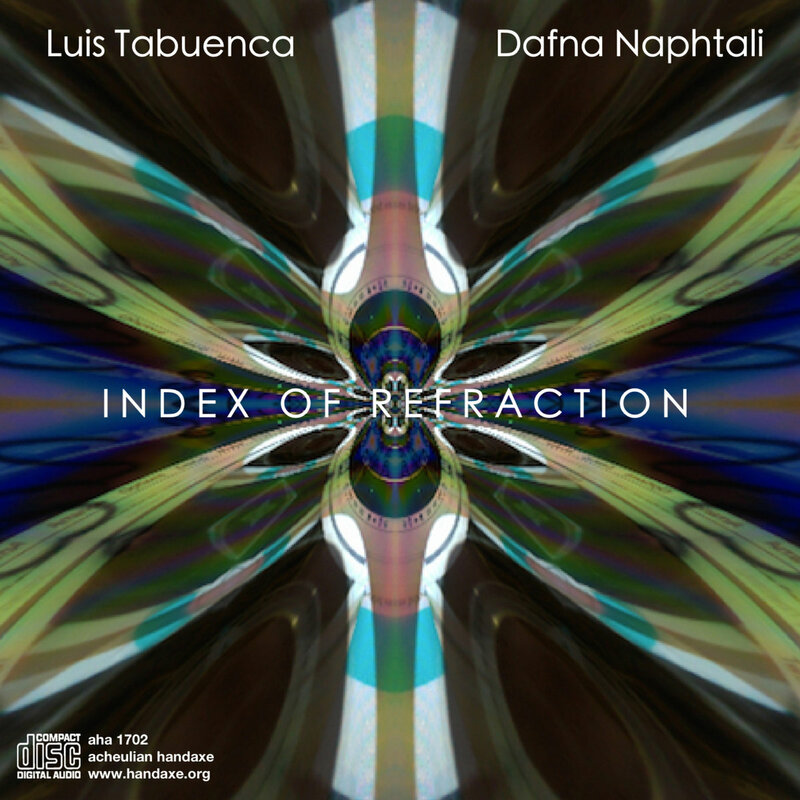 “Index of Refraction” is the debut album of the duo of Luis Tabuenca (percussion/ drums), Dafna Naphtali (voice/ electronics), recorded at Harvestworks in NY. An Index of Refraction of a material is a dimensionless number that describes how light propagates through that medium. Inspired by this definition, and translated/transposed to musical vocabulary– an index of refraction could be an analogy to the way in which acoustical instruments and the human voice behave when they are sound processed through electronic devices. Massimo Ricci / Touching Extremes. After the duo’s initial performance in Spain, Luis Tabuenca came to NY in Spring of 2014 for a residency at NYU’s Waverly labs. He and Naphtali performed shows around NY — as a duo, and with other collaborators — trio with Izzi Ramkisssoon (bass), and a quintet at The Firehouse Space with Briggan Krauss (sax), Stephanie Griffin (viola) and Jonas Tauber (bass). Their work together in NY culminated in the first album of this duo. This new duo release “Index of Refraction” was recorded at Harvestworks in NY. An Index of Refraction of a material is a dimensionless number that describes how light propagates through that medium. Inspired by this definition, and translated/transposed to musical vocabulary– an index of refraction could be an analogy to the way in which acoustical instruments and the human voice behave when they are sound processed through electronic devices. This concept in mind, we improvised music while processing and manipulating our sounds, both electronically and acoustically, in order to create new sonic landscapes, each track is based on the refractive index of a different medium. Dafna Naphtali y Luis Tabuenca / Festival Audio Tangente, Burgos España Nov. 26, 2013 from Dafna Naphtali on Vimeo. BicycleWheel-and-Feedback from Dafna Naphtali on Vimeo.